I was tidying my desk earlier when I suddenly thought: wouldn’t it be fun to see exactly how your puzzle solving time compared with every other solver?! 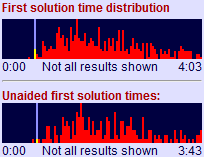 My result is the yellow/pale blue bar, and as you can see I was the second or third fastest on this particular puzzle. Previously all I’d have known is that I was better than average, and near the fastest. Now I can see just exactly where I fit in. I think this is great! Of course, it’s a bit embarrassing when your highlight bar is off to the right, or doesn’t even fit on… (it only shows the top 90% of results when there are 20 or more, and omits all results longer than 2 hours). Not a puzzle in itself, but I came across something related to Sudoku that’s so technically impressive that I just had to post about it. There are plenty of online or interactive Sudoku solvers, and even some real-world ones which take the pages of a book, scan it in and then solve. SudokuGrab for iPod/iPhone is one popular example, whilst other people have used a combination of Lego and a webcam to scan in and solve entire books. But how about this? 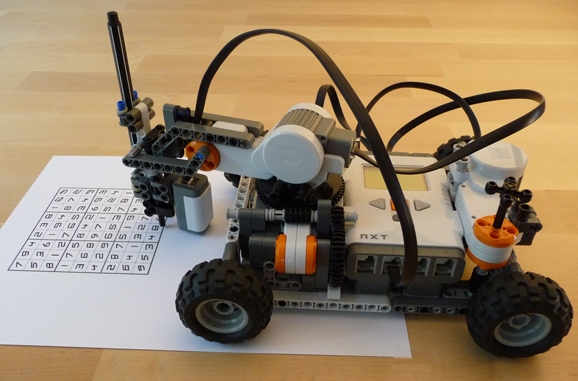 A Sudoku solver robot which you can build yourself, and doesn’t even need a computer to drive it – it runs directly from a single Mindstorms Lego robotics kit. It’s unbelievable to watch it work, using a single point light sensor which the robot waves back and forth over the paper to build an image – there is no Lego webcam which can be integrated with the Mindstorms robotic kit. And then, as if it wasn’t already impressive enough, it uses a real pen to write in the solution. It’s just amazing – take a look at the robot!